To minimise cost and stress, Louise and Owen planned a simple civil ceremony at their local registry office, followed by a lowkey wedding reception for 40 people, which was taking place in a hired marquee in their back garden. They may have wanted to avoid all the pomp and circumstance, but that didn’t mean they were going to settle for providing mediocre food! They still wanted an elegant menu befitting to their special day but needed a catering company who could provide that in their own back garden. In other words, they needed Taste The Cracklin! We cater for all manner of wedding receptions, both large and small, and our event planners work closely with the couple to ensure the food and service are exactly how they want it. Where we are cooking and what we are cooking may vary greatly from wedding to wedding, but whatever the setting or menu you choose, the high quality of our food and service remains the same! Louise and Owen were really pleased with our wedding menu options and decided on a formal sit-down meal, with a classic hog roast, roast potatoes and seasonal vegetables for the main course, with veggie skewers for the 4 vegetarian guests. 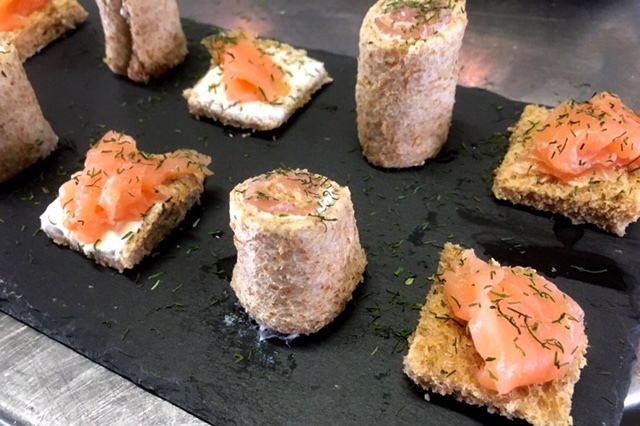 Given what excellent value for money our bespoke wedding packages are, they also chose some of our delicious handmade canapes to welcome the guests after the ceremony, including our mini quiches, pate encroute and smoked salmon! We arrived on the morning of the wedding to a house full of nervous, busy people! We didn’t get in the way though and set up in the garden to make a start on freshly preparing everything from scratch, ready to be served at 2pm when everyone came back after the ceremony.When the bride and groom and their entourage returned, everyone was visibly more relaxed than they had been when they set off! Our professional waiting staff were on hand to serve the canapes and make sure all the guests were seated comfortably to enjoy the rest of the meal. After tasting Taste The Cracklin’s delicious food and being delighted by our level of service, Louise and Owen knew they had made the right choice for their wedding reception. Thanks to Taste The Cracklin, they enjoyed the best of both worlds-a fine dining wedding menu in the comfort of their own home!